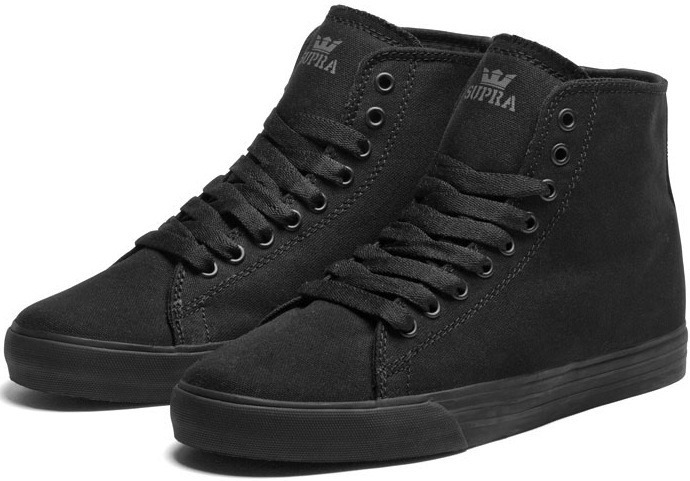 Supra Thunder is the classic hightop skate style. Light-weight, full ankle coverage, and vulcanized soles. All Canvas, All Black, All Vegan. They almost made Mr. Fakie’s War on Xmas list. I could have made Bob Clark jokes, but then I IMDB’d him and found out that after Black Christmas, he did A Christmas Story, and Baby Geniuses.I hate Baby Geniuses, they think their so smart. And A Christmas Story has let all the Goyim know were we eat on X-Mas, making long lines for Kung Pao Tofu.